NOTE: updated demo 1 on Dec 29 with textarea bug fixes, para wrapping, and a quick-dirty file chooser using the existing message box. Uploaded some video captures of the test programs. Note: Textarea had wrapping bugs in demo, subsequently fixed. Demo 4:combo’s with different insert policies and vertical alignments. Note that in these demos, I am showing both tabbing thru fields, and often invoking buttons by using the Alt-combination. No distracting voiceovers, but my apologies that you will see a watermark in the middle. My registered version of SnapZ Pro 2, hangs my oldish Powerbook, so i had to look for free alternatives. ScreenFlick is the best of what I tried, but leaves a watermark. Screen Movie Recorder (link) is a good option with no watermarks, but creates a 4 GB file taking 30 minutes to do so. Tried converting it to smaller sizes but go junk. Screenium creates only a 30 second file, so forget it. If anyone knows how i can use ffmpeg from the command line, to do video grab of Terminal (i supposed /dev/ttys000) (NOT X11), would appreciate that. Used ACS_ codes to make neater boxes. The earlier ascii ones were copied from Links. I hope all terminals can access the ACS codes. Radio and checkbuttons correctly align when align_right set to true. 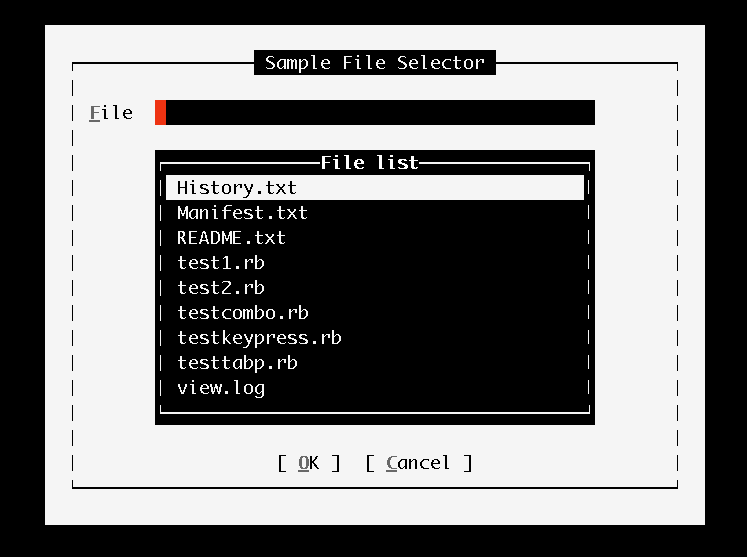 In Listboxes and buttons, where cursor position is not important, the cursor instead of being placed at the beginning of field, is appropriately placed in the button brackets, or row of listbox. Improved the test program screenshot to look more compelling. Other updates over the last couple days: combo popups can be configured to popup above, below, centered or overlapping the entry field. Textarea updates giving meaningful events that are very close to the changes that happened (barring wrapping changes) – using InputDataEvent class. Buttons use mnemonics for hotkeys, as well as the ampersand. For the new year, I’ll probably work on a multi-column list, either extend the existing Listbox, or introduce a singleColumn and MultiColumn data class, as well as RowRenderers or some such simple MVC. Will try to keep it simple, yet extendable. And before I forget, wish you all a Merry Christmas and Hannukah! Do UI’s fire events only when someone is listening, or always. Firing an event often means creating an event object, doing some calculations of what changes were made and what positions they happened in. Sometimes, one editing event can result in 2 events such as first a delete event and then an insert. Thus, it could be efficient to send events only when an object is listening. Currently, events are fired AFTER default behavior. This hopes to ensure that any exception or problem in a user-defined handler does not result in bypassing default behaviour. However, i just came across this interesting line on ActionListener. It’s the opposite of what I am doing. The root event class for all component-level input events. Input events are delivered to listeners before they are processed normally by the source where they originated. This allows listeners and component subclasses to “consume” the event so that the source will not process them in their default manner. For example, consuming mousePressed events on a Button component will prevent the Button from being activated. Rubycurses’ event model is undergoing a lot of change currently: in terms of parameters passed. Last night, modified it so multiple actions can be bound to an event of an object. However, the parameters passed to an event when fired is what is also undergoing change, as i test and play around with the same. At present way, we reference to the current object (that underwent the event). That gives the user flexibility to call whatever methods s/he wants. However, the user then has to go through documentation to figure out what he wants. Thus, I am thinking of moving all events to an Event object (as is already the case with ListData events). The Event object will contain a ref to the source object, as well as a relevant method such as selected_item, selected_index, value, event_type, etc as appropriate to that class of events. In addition, I might change some event names, (current ones were taken from Tk, but I’ve left Tk behind long back). I also need to change some method names before this library starts getting used. I was pleasantly surprised to find that vt100 and 200 do send keycodes that work correctly with rbcurse. However, in the menubar, highlighting of focussed menuitems and hotkeys was not happening. Made some changes so that highlighting works in both vt100/200 and also screen/xterm. I am mostly testing under screen and xterm. Are there any other major TERM’s I should check out. xterm-color blows as a TERM. Even vt100/200, xterm (and xterm-256color) send proper values for F1..F4 and backtab. xterm-color sends a 27,79,80 for F1 (i.e., three keys). So I spent the wee hours of last night hacking some ugly lines into window.getchar() to trap these combinations. Then i found that backtab is 27,79,81. Added more ugly code for that. But that’s about it. What is problematic is that xterm-color sends 27,79 for M-O (Meta or Alt O). I checked manver’s VER::keyboard.rb and for xterm-color it (incorrectly) sends “M-O” followed by the character “P”, although the code appears to check for this combination (See SPECIAL_KEYS in his code). So now my getchar() will send a M-O or F1 correctly for xterm-color, although the M-O takes a little longer to be passed to your program since it waits for getch to return -1. I suggest avoiding xterm-color since other keys could also bomb at some time. Please tell me if there are fixes for it. I like “screen” the best, although it doesn’t show underlines. We may associate a label with any field/widget with the label_for method. If a mnemonic has been defined for the label, it will register the ALT-key, to transfer keyboard focus to that field. If that field is a button (responds to fire), its fire will be called. e.g. we had created some fields in a loop. Now we add mnemonics to them. We had created a label for 2 radio buttons. Now we can associate the label with one radio button. We had used the underline property to create hotkeys for buttons. Now we use the same property to create hotkeys for radiobuttons, checkboxes and togglebuttons as can be seen in the screenshot below. The underline property was taken from Tk, however, i think its a dirty hack. A mnemonic is a better idea. I am considering phasing out underline in favor of mnemonic. In other news, combo selection behaviour has been improved. Check the tweets on the sidebar for small changes/enhancements.